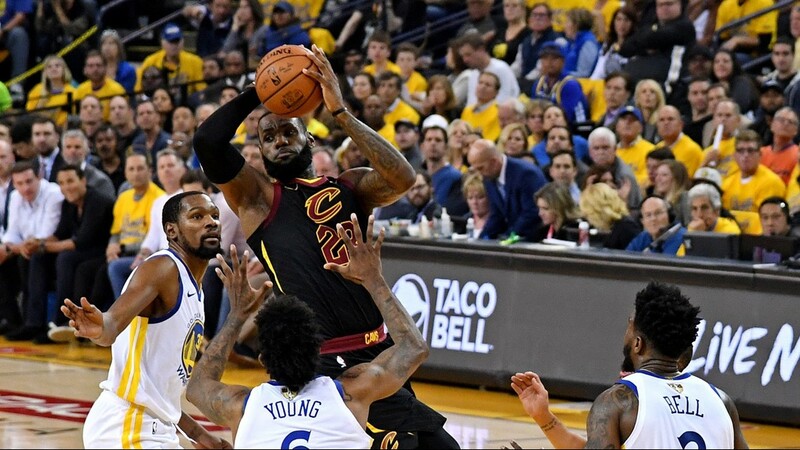 Cleveland Cavaliers small forward LeBron James drives to the basket against the Golden State Warriors in Game 1 of the 2018 NBA Finals at Oracle Arena in Oakland, California. 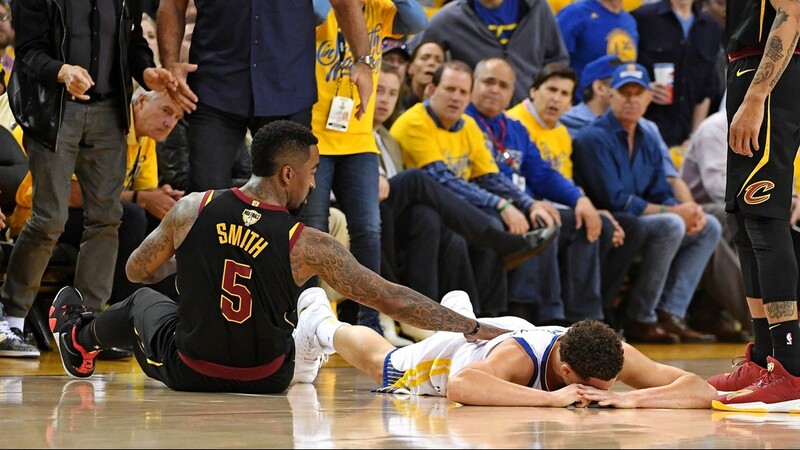 Cleveland Cavaliers shooting guard JR Smith checks on Golden State Warriors guard Klay Thompson after a first-half collision in Game 1 of the 2018 NBA Finals at Oracle Arena in Oakland, California. 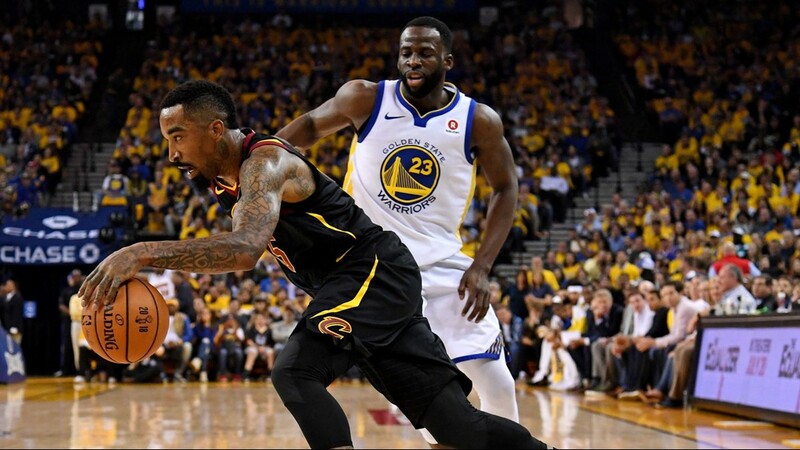 Cleveland Cavaliers shooting guard JR Smith drives to the basket against the Golden State Warriors in Game 1 of the 2018 NBA Finals at Oracle Arena in Oakland, California. 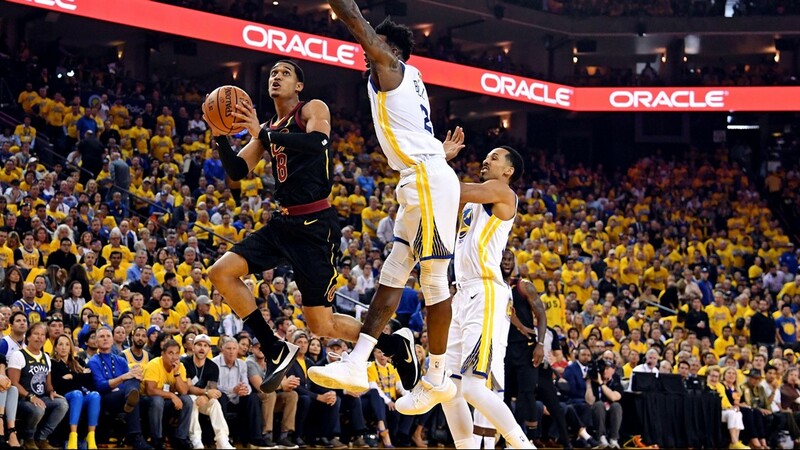 Cleveland Cavaliers point guard Jordan Clarkson drives to the basket against the Golden State Warriors in Game 1 of the 2018 NBA Finals at Oracle Arena in Oakland, California. 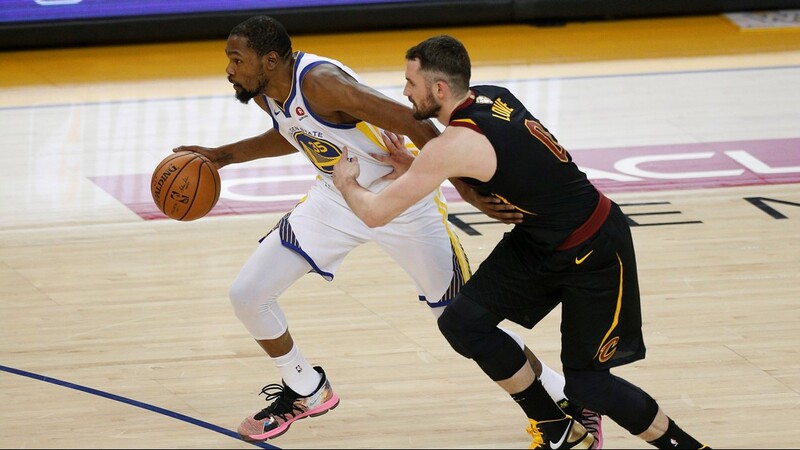 Golden State Warriors forward Kevin Durant drives to the basket against Cleveland Cavaliers forward Kevin Love in Game 1 of the 2018 NBA Finals at Oracle Arena in Oakland, California. 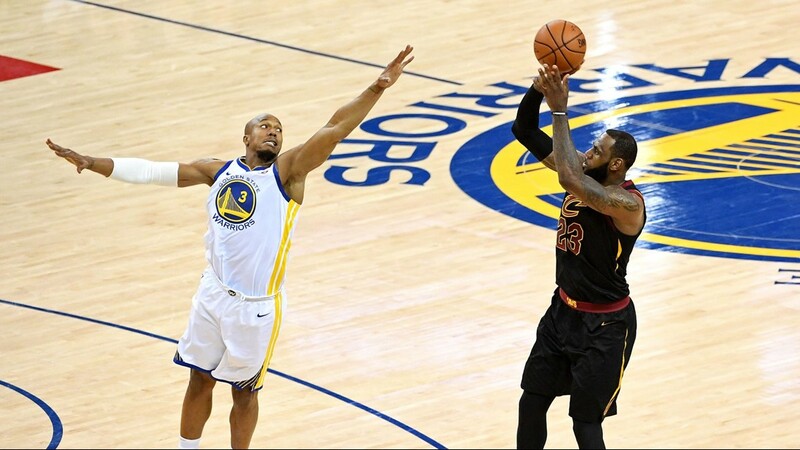 Cleveland Cavaliers small forward LeBron James raises up for a jump shot against the Golden State Warriors in Game 1 of the 2018 NBA Finals at Oracle Arena in Oakland, California. 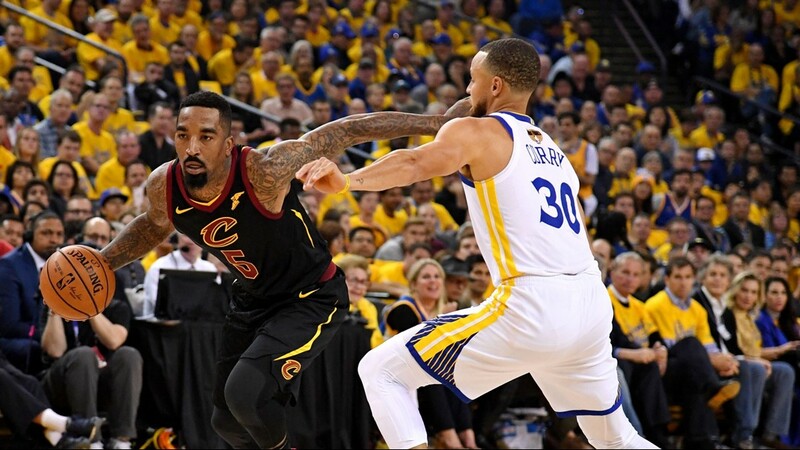 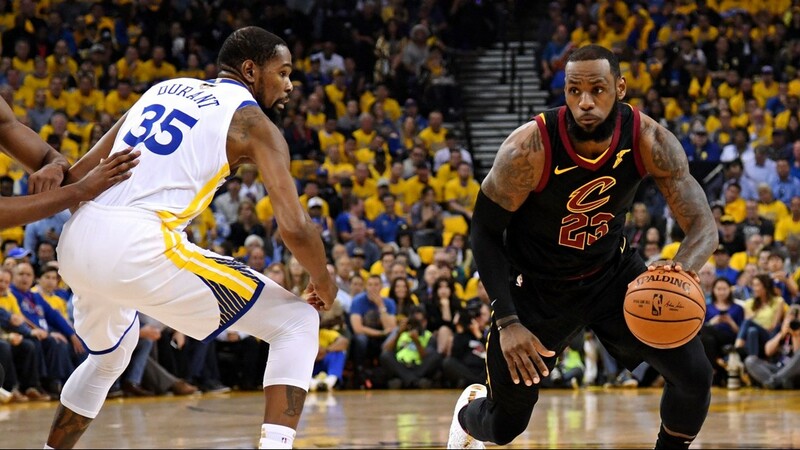 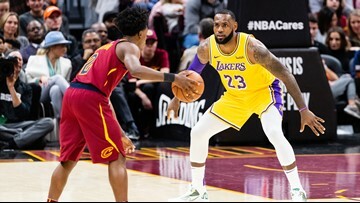 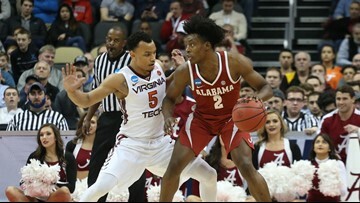 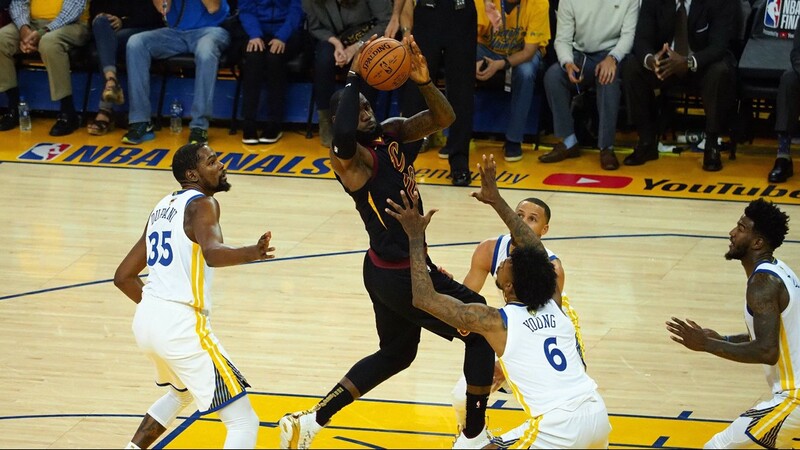 Cleveland Cavaliers small forward LeBron James looks to pass the ball against the Golden State Warriors in Game 1 of the 2018 NBA Finals at Oracle Arena in Oakland, California. 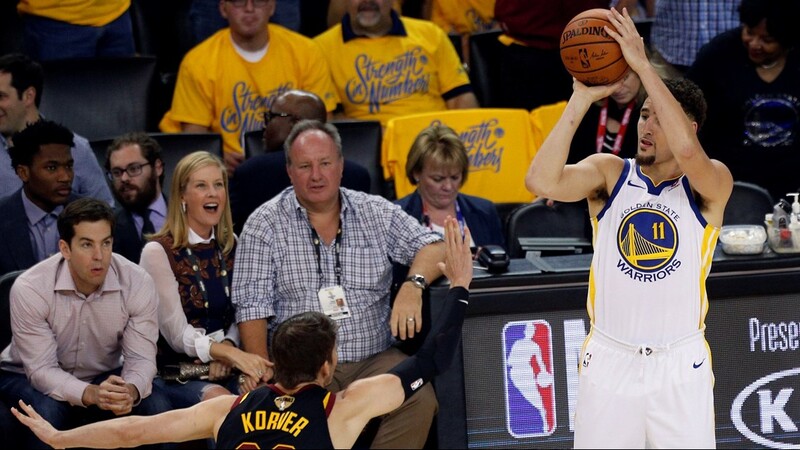 Golden State Warriors guard Klay Thompson shoots a three-pointer over Cleveland Cavaliers guard Kyle Korver in Game 1 of the 2018 NBA Finals at Oracle Arena in Oakland, California. 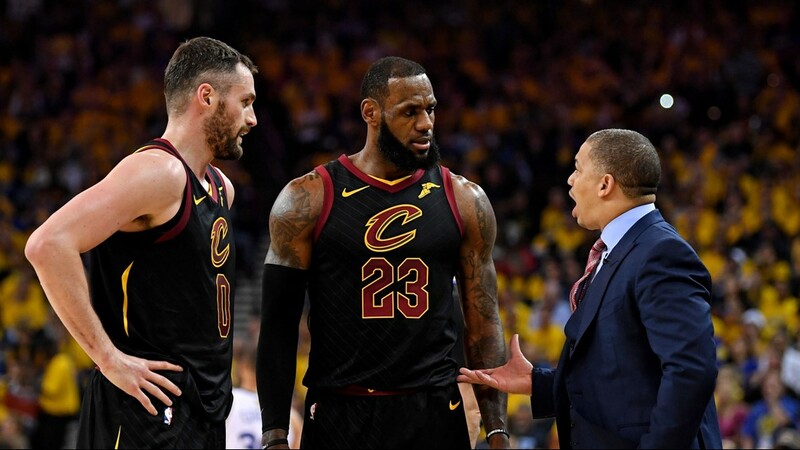 Cleveland Cavaliers small forward LeBron James (23) and power forward Kevin Love (0) meet with Coach Tyronn Lue during a break in the action against the Golden State Warriors in Game 1 of the 2018 NBA Finals at Oracle Arena in Oakland, California. 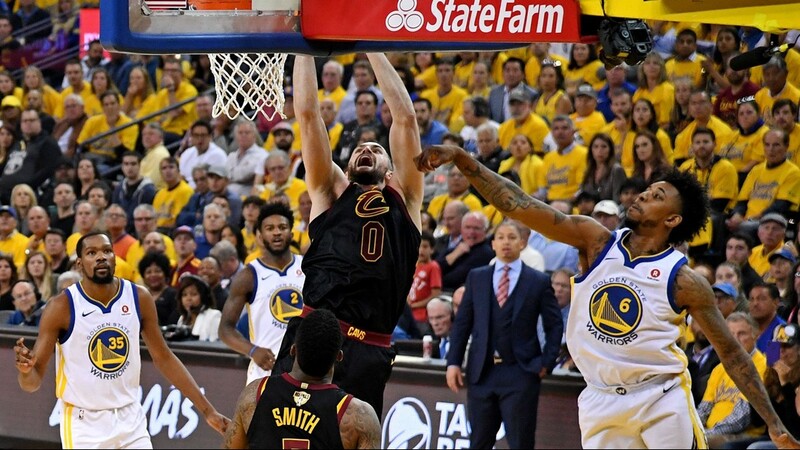 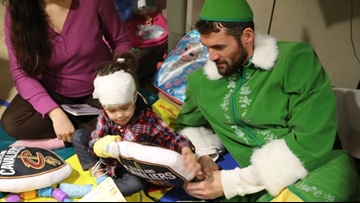 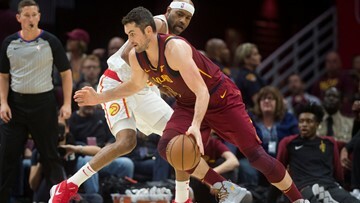 Cleveland Cavaliers power forward Kevin Love goes up for a shot against the Golden State Warriors in Game 1 of the 2018 NBA Finals at Oracle Arena in Oakland, California. 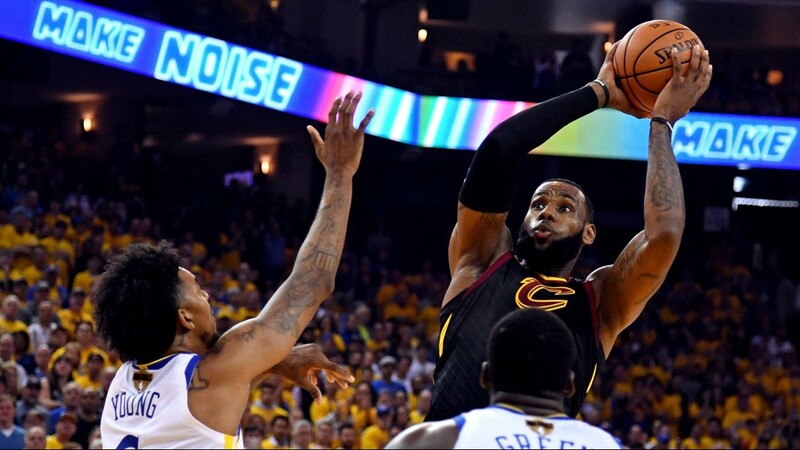 Cleveland Cavaliers small forward LeBron James fires a jump shot against the Golden State Warriors in Game 1 of the 2018 NBA Finals at Oracle Arena in Oakland, California. 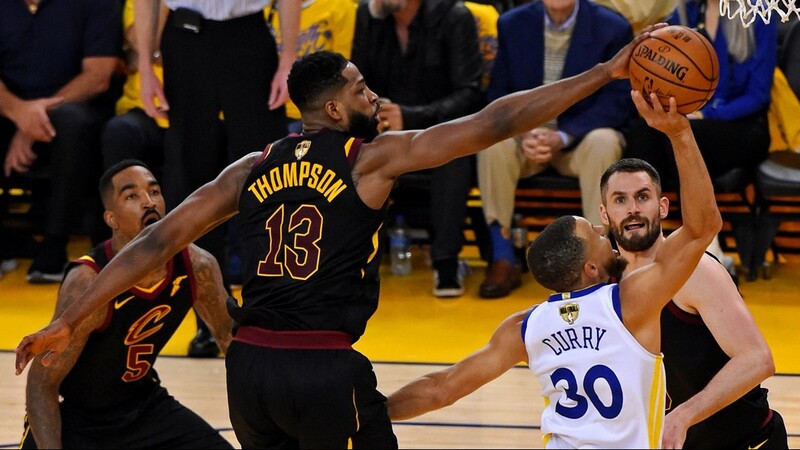 Cleveland Cavaliers center Tristan Thompson blocks a shot from Golden State Warriors guard Stephen Curry in Game 1 of the 2018 NBA Finals at Oracle Arena in Oakland, California. 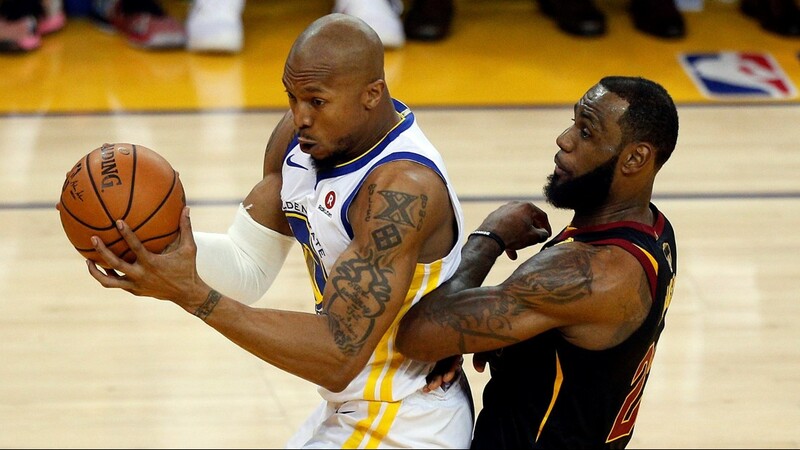 Golden State Warriors forward David West goes up for a basket while being defended by Cleveland Cavaliers small forward LeBron James in Game 1 of the 2018 NBA Finals at Oracle Arena in Oakland, California.